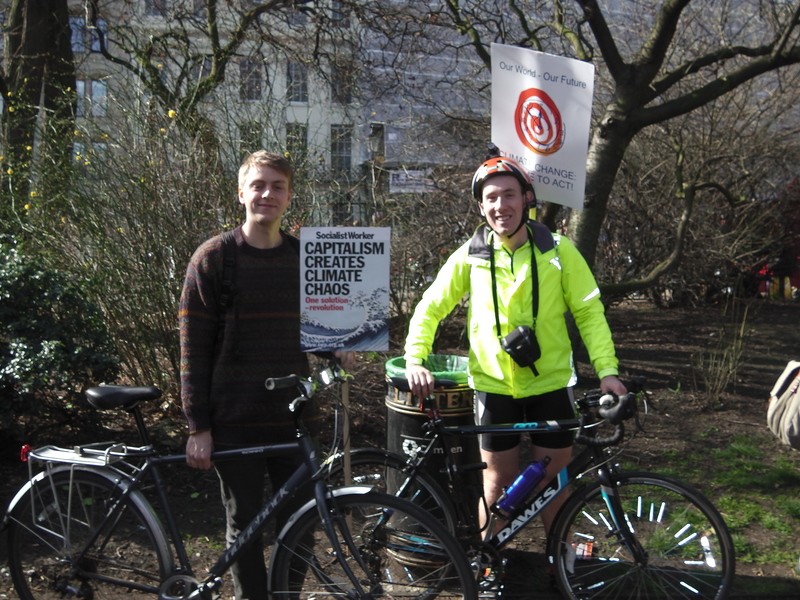 On Saturday 7th March, Tom and I took part in the #TimeToAct2015 protest. What wonderful day! I felt so relaxed and at such ease with myself. The lovely warm and sunny day may have helped – perhaps ironically I was enjoying a bit of a sign of climate change?! It felt as if we were on holiday. We arrived at Lincoln’s Inn Fields for about 12.45pm.. We had a little look around and absorbed the vibrant yet relaxed atmosphere of all the crowds. They were many different groups or blocs, all of whom had the same overall reason to be there. Action needs to be taken on climate change before it’s too late. This was a call to politicians who are meeting in Paris in December who could leave the talks with some positive action actually set in stone. More likely plastic. Slow and steady was our ride as being on bicycles meant we soon sped ahead of the marchers on foot. Tom was eager to be on the move and of course I joined him on the every so often nip off the route and around in a mini-circuit. A great opportunity this was to see the sheer scale of the protesters and also was great to get a change of scenery. 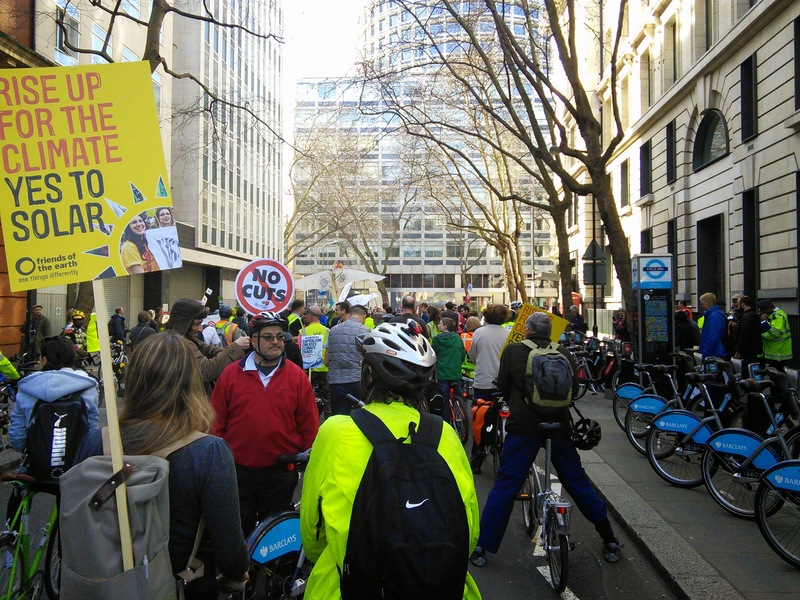 Just before we hit Trafalgar Square, with the cyclists far ahead and the snake of protesters broken up behind, an invisible wave was seen from far ahead to just behind us of people dismounting, lying their bicycles down and then lying beside them. With the sun beating down, this mini-lie down was both a protest within a protest but also just a great chance to have a rest. The protest moved on down Whitehall past Downing Street and then on Parliament Square. A group of protesters broke off from this official route and headed down King Charles Street, left on the Horse Guards Road and then back towards Big Ben. The police were disgruntled but there was no expected hostility. Right throughout the protest there was a police helicopter flying overhead. Think of the cost to the environment of that! Ahhh. After standing about on Parliament Square, watching some wonderful dancing and just absorbing the great atmosphere, we headed to a bit along Abingdon Street to listen to some speeches. 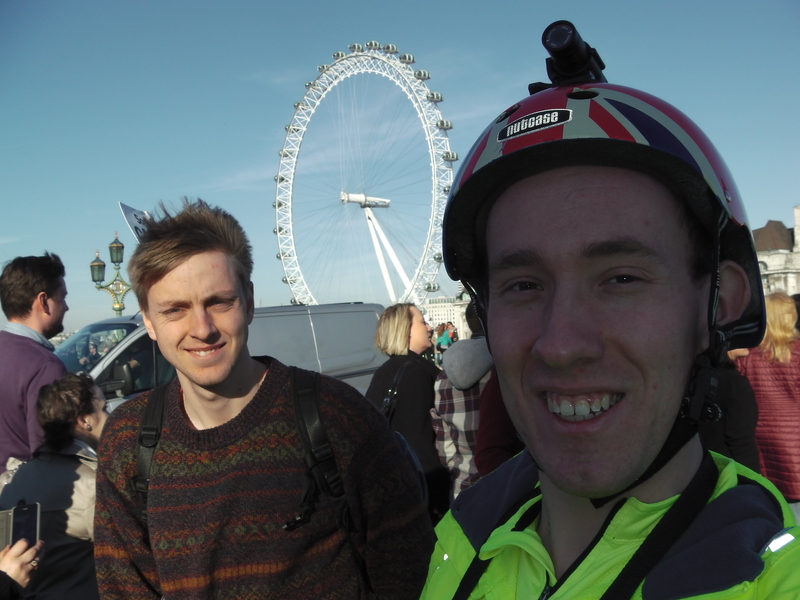 Then Tom and I cycled firstly over Westminster Bridge, over London Bridge and then over Tower Bridge and then back to his. I went to visit my cousin, his wife and their baby who live close by. Great seeing them! All in all, I cycled 40 miles. Nnnnnniiiiccccceeeeee.